For most organizations, the single most important piece of office equipment is the telephone. Business class phone systems usually start out costing a few thousand dollars, and the price increases proportionally with the increase in the size of the system and the number of features you want. The business class phone systems discussed here are for offices with ten people or more. The features that bring value to your business and connect your business to the world are going to increase the total cost of the telephone system. A phone system's salesperson will try to sell you all the bells and whistles (that’s their job), but you need to look at each feature and decide if it will add value to your business or save you money. Here are some of the more common features that are available on a business telephone system. Each brand is different, so ask the salesperson for a complete list of options. The auto attendant usually takes the place of a receptionist by presenting callers with a list of options to route their call (e.g., “Press 3 to speak with somebody in Sales”). It can also let callers directly dial a party’s extension. Conferencing Features allow two or more extensions to connect to share in a conversation. Usually, the default is two. If you require more than two, ask what the maximum number of participants is. Some systems only allow internal extensions to be conferenced. If you require external conference calls, ask about that, too. Automated Directory allows callers to look up an employee’s extension by entering the first few letters of their name. Voice Mail allows messages to be left for employees that are unavailable or on the phone. 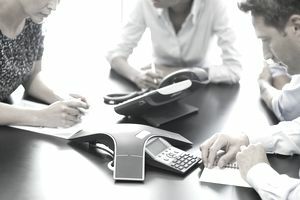 Some systems can forward voicemail messages to an employee's email and allow separate third-party voice mail equipment to interface with their equipment. Depending upon pricing, this could save you money. Call Hold is the ability to put a call on hold while the user attends to other matters. Usually included with the system. Call Forwarding gives the user the ability to forward all calls to another extension or to voicemail temporarily. Speed Dial saves frequently used phone numbers and allows the user to dial it with a button push or two. It is a useful timesaver for frequently called numbers. Redial allows the last number called to be redialed with the touch of a button. Paging allows a user to speak over a public address system to call for an employee or give announcements. Music on Hold gives your callers something to listen to while they are on hold. It can be music or prerecorded messages advertising your company. Back Up Power will provide an alternate source of electricity for 10 to 60 minutes in case of a power outage. Advanced features will add significant cost to the total system and will add an ongoing cost over the life of the system. However, this could be offset by reduced customer service and time-saving advantages they bring. Remote Location feature allows simple connections to off-site employees or small remote offices by simply dialing an internal extension. Find Me / Follow Me permits users to forward their phone on demand to another phone, cell phone, home phone, secretary, etc. Computer Telephone Integration (CTI) allows the phone system to interact with a computer system. Examples include the ability for a user to click on a telephone number on the screen and have the phone system automatically dial the number (reducing wrong numbers and saves time); or the passing of a customer's phone number to a computer when they call in order to pull up the customer's account and display it on the screen for the employee before answering the phone. This option is very pricey. Next, you will have to determine how many simultaneous phone calls will be coming into and leaving the office. The sum total of incoming and outgoing calls at any given moment is the number of lines (or trunks) that you will need. Common configurations are 3, 8, 12, 16, 24 or 48 lines. Larger systems have expansion slots so you can add more lines at a later date. Remember to account for future growth (25% is not uncommon). Important: if you underestimate this, callers will get a busy signal if all the lines are in use. Finding a dealer is not hard. First, you can search the Web for “Telephone Equipment & Supplies” to find a dealer close to you. Business and office technology trade shows are also good places to start. Not only will you be able to meet the sales and support people, but you may be able to try out a system, too. Finally, the best way is to ask around. Ask people you know who have a business with an office. You can also get their assessment of the quality of the equipment and level of service that was provided. Base Unit / System is the unit that controls the whole telephone infrastructure. Cost is dependent on the number of features you have, the number of phone sets it can handle, and the number of lines coming from the telephone company. Handsets / Desk Sets are the units that sit on the desks or are attached to the wall. They come in several different styles, capabilities, and prices. Prices can range from $70 to $1,000. Examples include Basic (cheapest), Mid-level, Executive/High-End, Receptionist Sets (most expensive) and Conference Table Units. Other options include hands-free headsets and wireless connections. Most handsets are proprietary and will only work with a base system from that manufacturer. If you are replacing an existing phone system, the cost of all new handsets (if you change brands) may make an upgrade to the next higher model the only affordable solution you have. Wiring is the blood vessels of the organization and must not be marginalized. If you are building an office, install extra wiring and receptacles in any area you think you may need a phone in the future. The cost will be a fraction of the cost if you have to go back later and punch holes in the ceilings and walls. If you are installing it in a building with existing wiring, have the dealer check the wiring for compatibility before you sign the contract. Installation and Initial Configuration will be the most time-consuming part of the project. Phone systems do not work right-out-of-the-box and most likely will have to be installed and initially configured by a trained technician. In order to get up and running as quickly as possible, make sure this is included in the contract. Other options that can be negotiated are maintenance, future modifications, and training for your employees. The final decision rests upon your shoulders. Telephone system salespeople can be aggressive, but remember that you are “the customer” and you are in charge. In order to get the best price for the system you want, deliver your requirements to several companies and let them bid on the project. Make sure you get a detailed proposal that covers all the areas outlined above. You will not get back an apples-to-apples comparison, so ask that the cost of the features be listed separately (or detailed, if they are included as a package of features). This will allow you to determine what is causing the differences in prices. If you are still unsure of a clear leader, ask to see a demo at an existing customer’s site. Lastly, compare the proposals and choose the one that meets your needs, allows for growth and, most importantly, you feel most comfortable with.